On the contrary, we have two respected and most widely used email service provider in the world which includes Gmail and Hotmail. But we apparently going to talk about one of the outstanding email server MSN Hotmail account. Every top business and entrepreneur find an email platform that options powerful security tools and efficient emailing experiences. Most of the business platform subjected to the use Microsoft email service due it flexible access on various devices, deliver secure and more powerful email experiences. Moreover, MSN Hotmail account is regarded as one of the top web-based email services providers offers by Microsoft Corp In the world. It provides you with a unique set of Windows Live ID which acts as an access pass to other various Microsoft Corp such as Skype, Word, OneNote, PowerPoint, Excel, Xbox Live, Office and more. In addition, the MSN Hotmail account enables you to build an attractive email by offering you with a various filter like Emoji’s & GIFs, Attachment, Get Add-ins and more. First, visit this link www.msn.com on your address browser using a secure web browser. At the same time locate the Outlook.com icon displays at the left corner of the page with your mouse, click “Create Now”. This will takes you to the login page and on the pop up where you see “No account”? Click the option “Create one”! 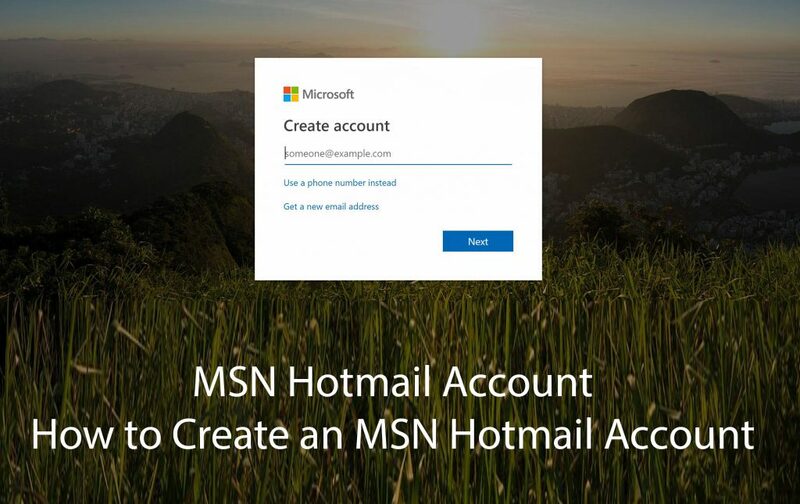 Then create new MSN Hotmail email address of the above format. Or you can select another option “Use a phone number instead” and enter a valid phone number. Create a strong account password by making sure you can easily identify but hard for others to guess. Then add your following details such as full name, country/region, and birthdate. Afterward, in order to successfully complete the entire account sign up procedures. Therefore requires to you perform the verification test by identifying the reCAPTCHA on the screen and type it on the text filed. In conclusion, after you correctly to identify the character, you will be welcome to your new account. Change your password every month and also make use of password of various character also don’t put your name as your password. Review your account activities to see where and when have your account been logged in. and if you suspect unusual login you can simply log out the location or device. Also, you can check your browsing history and clear all data, especially on public PC to avoid any extraction of info. Most important don’t click the “Keep me signed in” if you know the device you using isn’t your own. Above all, you can make use of an extra access protocol by setting up the two-step verification for free to provide extra login access. I Hope you comply with this following tips and stay safe while using your MSN Hotmail Account.